Windermere, FL Violin Lessons Near Me | Fun Classes. Top Tutors. Learn how to play violin with the bow and pizzicato, with the fingers. Learn good posture, care of the instrument, tuning, up and down bowing along with playing musically. Listening skills are important for the beginner, so listening to the correct pitch is part of learning to play the violin. Unlike most other instruments, there is no button to push or hole to cover rather the fingers of the left hand must be able to match the correct pitch while fine tuning to the ear. Simple melodies are learned using the open strings, D scale, A scale, G scale and C scale are among the theory that will be taught in this class. Playing a musical instrument is a total-brain workout. Engaging four cortices of the brain, making music improves overall cognitive function. Study the mother of all sciences and speak with one of Music's most expressive voices through the violin! I am guided by Galamian's classic principles of violin performance and pedagogy, focused through the holistic lens of Julie Lyonn Lieberman. A physicist by the name of Albert Einstein once said, "A table, a chair, a bowl of fruit and a violin; what else does a man need to be happy?" The answer, of course, is violin lessons! Hello! My name is Chris R. and it would be my distinct honor to teach you to play the violin. Lessons with me will be goal focused and setting some goals is something that we will do right away. Whether you want to one day perform on the world's biggest stages or simply play Christmas carols for a few loved ones, together we'll find the path that gets you there. If you're already excited about learning to play, shoot me a message and lets take our first steps right away! I offer fun and thorough violin lessons. I teach different methods from Suzuki to Michael Allen's Essential Elements for strings. I try to bring music to students in fun way through playing music songs and learning student's favorite music pieces. Let's make music together (I play piano and accompany student on violin). This instrument can be a challenge, but worth it.. Whether it's your first time picking up a violin, or you need a little help with orchestra/audition music, I can help you accomplish your musical goals! Lessons will focus on note-reading, intonation, rhythm, tone quality, and all other important aspects to improve your violin playing! Yamilet realized her love for music at the early age of 7, after singing along with children's television shows and joining her elementary school chorus. She was also a member of the Orff ensemble and in the 4th grade began learning to play the violin. Using that background knowledge, she began to teach herself piano. In the 5th grade, she switched to cello. Although she has always had an insatiable curiosity with musical instruments (playing as many notes as she can figure out on harmonica, guitar, recorder, clarinet, double bass, viola and even water-filled glasses) she has stuck with the cello for almost 15 years. tudying with Orlando Philharmonic Orchestra members Barbara George and Laurel Stanton. She recently completed her Master of Arts degree in Music Performance. In that time, she performed with the UCF Symphony Orchestra, under the direction of Dr. Laszlo Marosi, and was the principal cellist for over 5 years. She also played with the UCF Chamber Ensemble, String Ensemble, New Music Ensemble, and sang in the Women's Chorus and Opera Workshop. Locally, Yamilet has performed with the Space Coast Pops Orchestra under the direction of Richard Hayman, alongside guest artists including Carol Stein, Copeland Davis, and Valerie Pernice. She has also played alongside well-known artists/bands such as Jodi Benson, Mana', Kansas, and Classic Albums Live. Yamilet also enjoys performing and recording for local bands and artists such as Urbe Prima, The Drive to Uqbar, Ratham Stone, Stockholm, Hoyle, James Roquemore, and Edgar Junior. My job as a teacher is to help you learn everything you need to know about playing your instrument, and really perfecting your technique. I like to use the Essential Elements for Strings book because it is straight-forward and lets you move at your own pace. Once you are proficient enough with the basics, we may move on to the Suzuki Solo books and take time to be able to get each piece to a performance-ready level. I provide music stands, appropriate seating, and supplemental music. I expect the students to have their own instrument and necessary accessories (rock stop, rosin, shoulder rest). My son was so happy in his first lesson with Yamilet!!! Yamilet was super attentive and really made the lesson interesting for her. We are so very excited to continue with her! Violinist with professional experience in all styles. Classically trained with a Galamian background. Other styles include folk, jazz, rock, pop, musicals, and world (Indian and East Asian). Lessons with me are disciplined with a fun and optimistic approach. I am also an arranger so we can work on any song/piece you’d like and I create etudes and different levels of the same piece. Depending on what style of music you are interested in learning, we can focus on a more ear-based or sight-based learning, of course learning both are useful for any style. I love practicing and performing violin and wish to share my experience and knowledge with others. I travelled the world studying and performing violin, everything from classical to rock. I performed at the White House, taught at music camps in Scotland, played on national tours, been on numerous TV specials, and recorded official tracks for theme parks. I hope to help you love this artistic discipline! Hi, thank you for stopping by my profile! My name is Lucas Brown and I teach the violin! Currently, I serve as Adjunct Violin Professor at Seminole State College as well as run a private studio of my own for students in and around the Orlando area and many online students from all over the country. I'm happy to teach students, young and old (it's never too late to start!). I have a wide range of people that I teach, whether it be younger students who need help with school orchestra music, intermediate or advanced students working on challenging technique or repertoire for auditions, or even people who have always wanted to learn for fun but have never had the time. fer bi-monthly lessons. I'm happy to work with you and whatever is possible in your schedule! My lessons generally consist of technique work (we usually start our lesson with whatever scale we've been working on that week), followed by an etude and finally the repertoire, however this may vary depending on the student's goals for our lessons. For me, the most important thing about my lessons is that student is learning while having fun and is never afraid to ask questions. I usually use a bit of a hybrid teaching method, incorporating Suzuki, Essential Elements, and etude books (usually Wohlfahrt or Kreutzer). If the student has a specific request for a song or piece that they've always wanted to learn, I'm more than happy work that into the lessons! I've been playing violin since I was 11 years old and currently hold two degrees. A Bachelor's degree from Florida State University and a Master's degree from DePaul University in Chicago - both are degrees in Violin Performance. I began violin in the public school system in Tallahassee, FL and eventually began taking lessons privately with an emphasis in the Suzuki Method. These days I serve as 1st Violinist for the Classern String Quartet, as well as perform with the Space Coast Symphony. Please let me know if you have any questions! I'm happy to help with very serious students wanting to make a career in music as well as those who have always been interested in learning the violin for fun. I'm here to help you! First lesson and learned a ton already! I have been teaching professionally for 17 years! One of my favorite parts of teaching is being able to customize the lessons to meet the needs/goals of each student. All ages are welcome! I believe that music should be an expression of you! I will provide you with a strong foundation that will allow you to continue your musical expression long after your lessons end. Because I teach all ages, I keep my clearances current. As a professional musician, my greatest desire is and always has been to teach others to love music. Music has always been an important part of my life. I have been playing violin since I was 6 years old and singing for as long as I can remember. I knew in elementary school that I wanted to “grow up” to be a violin teacher, and so everything I did was to pursue my dream of opening a music studio - from performing in Youth Symphonies, Musical pit orchestras, college orchestras & community orchestras to singing in choirs and touring Europe with the Madrigalians (an elite singing group where we sang in some of the most beloved cathedrals in Europe such as Notre Dame Cathedral and Sacre Coure). I graduated from Trevecca Nazarene University in Nashville, TN with a B.S. Degree in Music Performance on Violin & Voice. dio I cater to the musical needs of children as young as 3 and adults as old as 90. I am acutely aware of my students’ unique personalities and their individual needs, and will develop a finely tuned plan to enrich and educate so that each student can reach their highest potential! I enthusiastically welcome parental involvement as I believe it is vital to students’ musical growth. Music is my passion and it would be my honor to share that passion with you and your family. Never took vocal training before and I learned so much .......... Angel is great ! Our daughter started taking violin lessons in first grade and vocal lessons in third grade with Angel and we are amazed at her musical growth and development! Angel is patient and encouraging which brings out the best in our child. She has learned the technical aspects of violin and voice and has developed her ability to perform her talent in front of others. Angel's love and appreciation of music is contagious! Mifflinburg is very fortunate to have a musician with her talent teach the children and adults in our area! Angel is very good at what she does! She is so patient and keeps the lessons fun for my six year old all while teaching her necessary skills. another from time to time and we all miss Cara. She is a wonderful teacher! Exceptional!" a youth orchestra to broaden her skills." "Lucas is an awesome instructor, he's very detailed and very patient with questions from beginners." y to have him as a teacher and I am sure you will feel just as well if you have the opportunity of having him as a teacher. You will have fun while learning the violin." "I love my violin teacher! Lucas was very encouraging about my learning violin at my age." "She is outstanding. 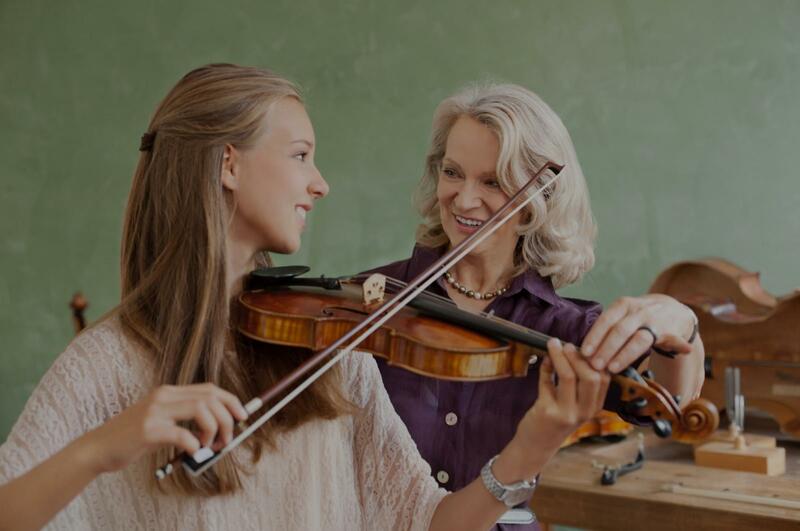 I am very impressed with her teaching my daughter violin." "Yamilet was super attentive and really made the lesson interesting for her. We are so very excited to continue with her!" Orlando, FL teacher: Yamilet T.
s as her lessons are challenging, fun and engaging."